The HVR200T 2 Henry Turbo has been discontinued by Numatic, but if you want one you might still be able to find it. (Or check out availability of the Henry Hound which is very similar.) It has the same main features of the regular Red Henry with the addition of a 24V turbo electric self-adjusting power brush. Like the Red Henry, the turbo is a dry only vacuum cleaner with a powerful 1200W two stage motor providing high and low ("Hi" and "Lo") 2-speed operation. It has a 10m cable with an easy to use rewind system. This latest version of the Henry Turbo has the new MicroFresh filtration system. Micro being 98% eficient and fresh by virtue of a giant activated charcoal filter membrane sandwiched between twin Tritex filters, providing a high degree of odour control. These new features mean the Henry Turbo is the luxuary choice for extensively carpeted and also pet owning households. The Henry Turbo is supplied with "Accessory Kit T22". When buying any Henry you want to make sure you find a good supplier. Online it can be difficult to know which suppliers you can trust but I have found, to my surprise, that Amazon sell other things beside as books. What&s more they have some of the best vacuum cleaner prices and provide the security of buying from a well known and trusted company. So I have included a Henry Turbo product link to Amazon on this site which displays their current price. And remember, with Amazon delivery is included in the price shown. 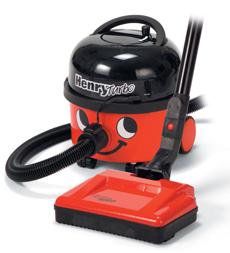 Simply click on the link to purchase your very own Henry Turbo Vacuum Cleaner.